Any fish of the bony fish order Lophiiformes, which hve an outgrowth they wiggle to lure and catch their prey. 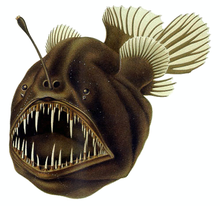 Anglerfishes are members of the teleost order Lophiiformes (pronounced /ˌlɑːfiːəˈfɔrmiːz/). They are bony fishes named for their characteristic mode of predation, wherein a fleshy growth from the fish's head (the esca or illicium) acts as a lure; this is considered analogous to angling.